Talk to any expert on tax return filing and he would suggest you to “verify your Form 26AS”. Form 26AS is consolidated statement of all your TDS, Self Assessment tax, advance tax, tax refunds, and high value transactions for relevant assessment years. The post gives an overview and structure of Form 26AS, why it’s so important, what to verify and how to use it for Income Tax Return filing. Also Read: ITR 2019 – Which ITR Form to use for AY 2019-20? How to view information in Form 26AS? Once the Form is opened, you have option to select the Assessment year and the format “View as”. Select the relevant Assessment year and the format and click view. Select ‘HTML” to view it online and “PDF” to download it. Password for opening downloaded Form 26AS is date of birth of PAN holder in ddmmyyyy format as mentioned in PAN Card. So if your date of birth is January 1, 1980 then your password would be 01011980. Also remember the difference between Financial and Assessment year (for Financial Year 2016-17 the assessment year is 2017-18 and so on). The 26AS is divided into 7 broad sections (A to G). Following are the details for each section. PART A – Details of Tax Deducted at Source. This section is most common and has details of Tax deducted by your employer or TDS deducted by banks on interest on Fixed Deposits, etc. TDS deducted by each source is shown as a separate table. 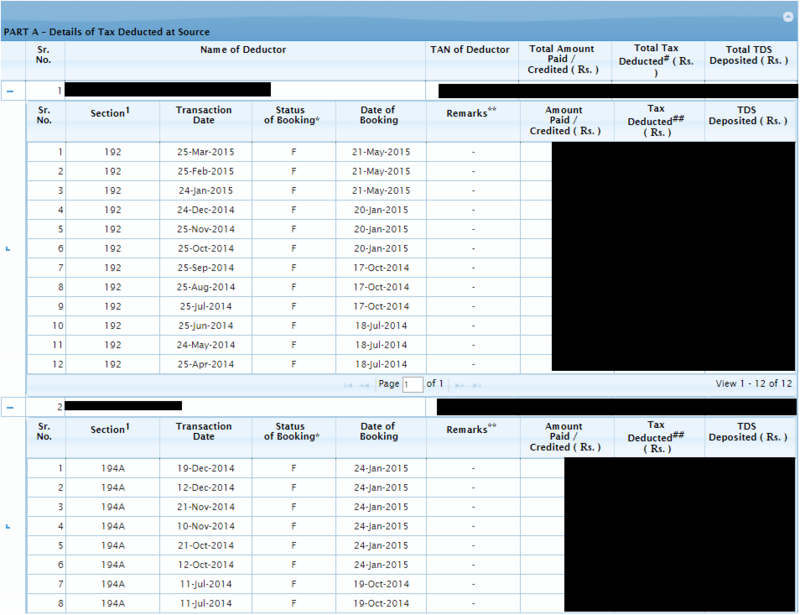 This section shows details of the income where tax was not deducted as you had submitted form 15G or 15H. The TDS will always show “0” because you have submitted Form 15G/H for not deducting TDS. It helps in tracking the interest you received. This is tax that is collected by seller from buyer on sale of certain goods like liquor, timber, minerals, etc. This would be mainly populated for people involved in such trades. Also Read: How to Claim Tax Exemptions while filing ITR? This part shows any “Advance Tax or Self Assessment Tax” paid during the financial year. The banks generally upload this information after clearing of the cheque. What should be verified from 26AS? As you can see it’s a long form but is visually easy to understand. The question is what should be verified in this form? The answer is EVERYTHING. Yes you should verify all the numbers and relevant details present there. Check status of booking. It should be ‘F’ which means Final. This means that the TDS amount deposited to income tax authorities match with the TDS statement filed by deductor. In case its “U” meaning Unmatched, it means there is some issue either with the TDS statement or the amount deposited. You will need to check with the concerned deductor in this case. Form 26AS – What should be verified? What if entries do not match? As stated above in case someone has deducted TDS but has not submitted or updated it wrongly to the income tax authorities, you might see wrong or missing entries. In that case you will need to contact that person/company. In case your advance tax or self assessment tax paid does not match, check with your bank. In case your Form 16 details do not match consult your employer. In case you find some entries missing consult with the relevant entities. Why you should check 26AS before filing ITR? Form 26AS can be compared to your resume while applying for any job. The interviewer knows everything mentioned in your resume – similarly, income tax authorities know about all the information present in 26AS. And as you would not mess up in interview by not preparing what’s on your resume, similarly you can mess your income tax returns by not verifying the entries in 26AS. And the worst part if you have discrepancies in the 26AS and your income tax return, you might get notice from income tax for wrong returns or for scrutiny of documents. Have you checked your Form 26AS while filing your ITR? Just want to confirm where should I mention FD whose interest < 10000/- with Bank and which is not mentioned in TDS(from traces) while submitting ITR? Moreover, where we have to enter PO's NSC interest? If NSC is done in the Financial year(against whom ITR is filled), then, also it's yearly interest had to be displayed? One more query, Suppose I do an FD on say 31 March 2018, then I have to add interest of that FD too(since it is done on last day of F.Y.)? I got intimation for difference in income between form16 and return filed. But, when I checked, I do not spot any difference. There is an entry for refund in the form26as and the amount mentioned is same as the difference highlighted by the IT department. Could that be reason? One tax expert was saying that the difference could be due to employer did not mention appropriate information for quarter 4, and the difference is due to this. Could you please provide your view? I paid TDS amounts for installments on construction of house property. These TDS payments are appearing in the section A2 (For seller of property) in my Form 26AS, leading to a mismatch in the IT return. How can this be rectified? Sir please help me that my 3 month salary arears given by employers June 2017 .26 as form not sown 3 month salary when I m sabmitt full financial year 2016-17 salary in my income tax aagadan form .form 16 sow full income but 26as form sow 3 month less .that conditions I fill itr how? Take Form 16 as reference to file ITR. If you have received money, pay tax on the same weather its reflected in 26AS or not. In Form 26AS, under PART A1 – Details of Tax Deducted at Source for 15G/15H, I have Paid / Credited(93500/-Rs) with the bank FDs as per section 194A. My question is whether I have to show in ITR-1 with bank details like Name of deductor, TAN of deductor ect…? or need not be shown. What can I do? In case Form 15G/H is submitted, there would be NO TDS. SO you can skip the entry for tax paid section. But you’ll need to show the amound credited/paid to you as income from other sources and pay tax if applicable to you. “TDSCPC services for NRIs is available through https://nriservices.tdscpc.gov.in/nriapp/login.xhtml . Kindly register and access TDSCPC NRI services through same”. However, this appears to be for NRIs. I am not sure if non-NRIs also have to access TRACES on the same link. Could you please clarify, thanks. Seems like you are trying to access site from outside India. Ideally you can go to Form 26AS from net banking or income tax return file website. I filed my IT Return online after considering the form 26AS. However, after reading various comments, it seems that I have also to take consideration of the savings bank interest for which no TDS has been deducted. Can I now revised my IT Return ? The T.D.S. ( Tax deducted ) in 26 AS is correct but Tax credit in ITR form shown is less ( differ ). in assessment year 2017-18. I submitted my ITR as per 26 AS by filling I.T.R. form for FY 2017-18 ( by correcting T.D.S. as shown in form 26 AS ). a few days ago . But should I do now, please guide.. I am not sure why its showing mismatch as the comparison should happen with Form 26AS. Please check if the numbers have not changed in 26AS? It has been informed by IT deptt…. that , ” There is some fault in system of I.T. Deptt. Many persons are feeling difficulty due to Mismatch in enteries shown in Form 26 AS and enteries shown in ITR. While enteries shown in form 26AS are correct and enteries shown in ITR are less. IT deptt. is looking in to this matter ie. for rectification of enteries.” ……IT deptt. has advised to wait for some time. Thanks for sharing – will help readers! Thank you very much for your valuable advice.Today i submitted efiling itr successfully. And without your guidance it was impossible for me. In FY 2016-17, i received arrear on DA for five months of same FY. But in form 26AS ,the total amount shown under total amount paid/credited is without arrear.why is it so? During income tax assessment i have included amount of arrear for income tax deduction.should it be calculated separately? You can calculate tax on arrears in easy steps! In 26As form,amount from arrear is missing.but in self assessment of income tax,i included that amount and calculated taxable amount. And that amount has deducted in form 26as. Please, give me advice . Yes you have to include arrears in your income tax calculation. i am abroad in usa and I can’t access my form 26-AS.is there any other way to access? I am Kunal Bisen, I received mail from Income tax sept. of Intimation u/s 143(1), showing the Tax Credit mismatch of Rs. 5068 and also my Form 26AS showing Nil. But TDS is deducted by my deductor. You will need to contact your deductor as to why TDS has not been deposited to income tax department. 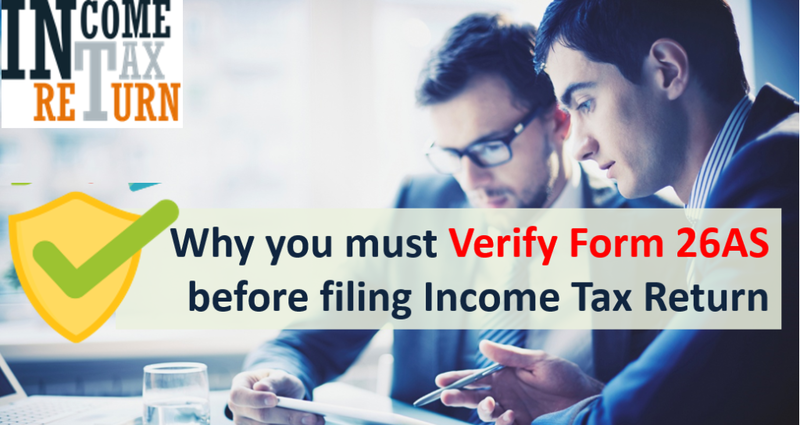 You should always verify your Form 26AS before filing your return. but my deductor gave me the Tax deposit receipt which he had received from bank. TDS deductor has to file TDS returns. Ask him if he has done that. And if yes you need to check if the details like PAN number/name etc was entered correctly. In form 26 for interest on FD/Savings account, section 194A, Total amount shown under “total amountpaid/credited” comprises of interest from both FD+savings interest ? or is it from FD only ? There is no TDS on interest paid on savings account. So the TDS shown in Form 26As is for fixed deposit and recurring deposit only.